6. regional specific solutions for increasing innovation capacities. Strategy and Memorandum of Understanding to encourage innovation and greater labour participation of women and elders in SMEs and to increase the attractiveness of regional labour markets and support the EU Baltic Sea Strategy. Development and publication of a manual on promoting innovation through increasing labour participation of women and elderly and the proportion of women entrepreneurs in SMEs; target groups: women, the elderly and SMEs. Economic analysis in the BSR countries and regions: economic structure, level of innovation of SMEs, labor force participation of women and elders generally, and of female entrepreneurs and business starters in particular; target groups: policy, management, consultant and trainer. Analysing regional education and labour markets: labour participation, attractive education programmes, diversity in labour market, sector, future prospects etc. target groups: policy, administration, consultants. Analyses and preparation of at least 10 Best Practices on the promotion of labour participation of women and elders, especially from Denmark, Sweden, Norway and Finland. Transfer to the countries south of the Baltic Sea. Target groups: politics, administration, SME promoters, consultants. Evaluation and documentation of the presentations and results of the international conference and of all project results in a book. Target groups: politics, administration, academies/ universities, chambers/ SME promoters. 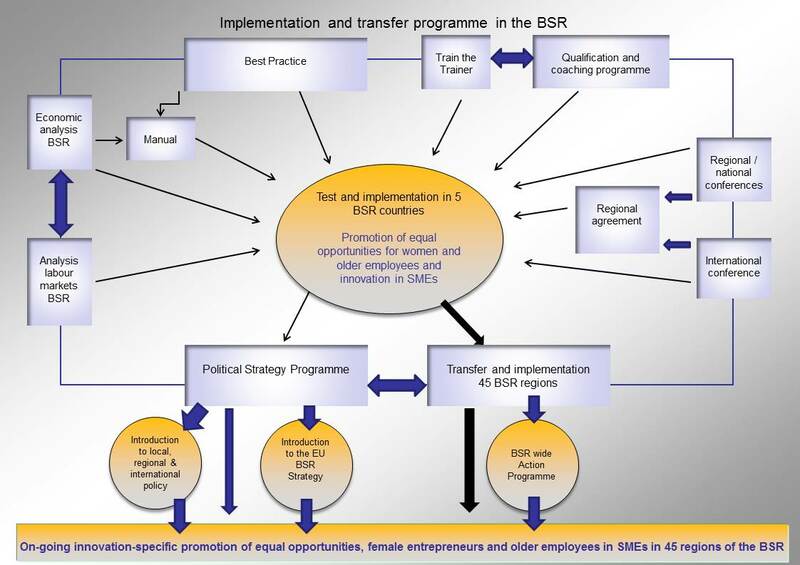 Development and operation of a BSR-wide information, consulting and support internet platform to foster innovation and the labor participation of women and elders. Target groups: women, elders, consultants, SMEs, SME promoters. Strategic programme and Memorandum of Understanding to promote innovation and labour participation of women and elders in SMEs as well as to increase the attractiveness of regional labor markets and entering in the EU Baltic Sea Strategy. English. Target groups: politics, administration, SME-promoter. action programme for 45 SME promoters (chambers + associations) in all BSR countries on promoting higher labor participation of women and elders and, thus, increasing innovation capacities in SMEs. Target groups: chambers, associations, SME promoters. action programme for 15 academies/ universities from 9 Baltic Sea countries on the promotion and qualification of consultants, which support the labour participation of women and elders. Target groups: Academies/Universities, consultants, chambers, associations. implementation of trainings for consultants by universities and academies. Target group: Teachers of academies / universities. international conference with politicians, administration, universities, chambers, women and elderly as well as SMEs for the promotion of innovation and higher labor participation of women and elders in SMEs through adjusted work cultures and structures. Information campaign with at least 5 TV shows of 45 minutes, 5 press conferences, 5 press releases and 5 publications of own articles. International Advisory and Transfer Conference with 45 chambers/ associations/ SME promoters and 15 academies/ universities from all Baltic Sea countries for the transfer of project results and sustained implementation of the project-developed support measures.